There are nearly 740,000 healthcare professionals across the U.S. who hold the title licensed practical nurse (LPN) or licensed vocational nurse (LVN). These terms are actually synonymous: 133,000 nurses in California and Texas use the title “LVN,” while those in the remaining states are called “LPN.” An aspiring LVN must enroll in a state-approved education program and pass the National Council Licensure Examination for Practical Nursing (NCLEX-PN). 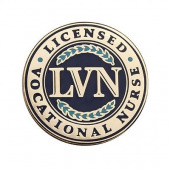 Once licensed, an LVN can legally provide care for patients in numerous environments, including general medical and surgical hospitals, continuing care retirement communities, assisted living facilities for the elderly, home healthcare services, nursing care facilities, and the private offices of physicians. Over 250 LVN certificate programs are offered across California and Texas. While community colleges and technical schools are the primary enrollment options, an increasing number of four-year colleges and universities offer LVN training as well. Some programs are also offered at local hospitals and high schools. Admissions requirements vary significantly by school. In general, students must satisfy GPA requirements and course prerequisites, submit SAT or ACT scores, complete placement testing, and provide prior coursework for transfer approval. Applicants must also pass criminal background checks, complete drug tests, obtain CPR certification and malpractice insurance, and submit health records to participate in clinical nursing courses. Once admitted, students can expect to spend one year immersed in areas such as anatomy, physiology, basic nursing, nutrition, biology, emergency care, pediatric nursing, pharmacology, obstetric nursing, and medical-surgical nursing. These subject areas, along with supervised clinical experience, prepare students to perform a wide range of healthcare duties. LVNs care for patients with tracheostomy tubes and ventilators, monitor patients for a change in clinical condition, collect specimens, give feedings through nasogastric or gastronomy tubes, administer oral and intravenous medications, change wound dressings, and care for ostomies. While most LVN programs take one year to complete, some accelerated certificate programs require just seven months of fulltime study. Conversely, LVN programs that confer an associate of applied science (AAS) degree may take up to 24 months to complete. Several factors affect tuition, including length of program, type of school, region of the country, and resident status. For example, state residents may pay as little as $3,000 to attend a community college certificate program, while non-residents may pay twice this amount. Tuition at a private college or university often averages $20,000 to $30,000 annually. Fortunately, LVN graduates experience a substantial increase in their pay. Texas LVNs earn approximately $43,000 annually, while California LVNs receive over $50,000 per year on average. High-performing vocational nurses can earn $60,000 or more. Nurses who pursue certification in a specialized area can see a pay increase of several thousand dollars annually. Enrolling in an accredited licensed vocational nursing program is the first step towards success in this field. Browse our directory to find top LVN schools in your local area.